I've always despised reading instruction manuals. I would do anything to avoid them, relying instead on my intuition to assemble and/or make things work. I just didn't have the patience, and I usually found I could figure it out on my own, get my husband to do it, or just concede defeat: do I like having the GPS feature in my car--yes! Can I use it--nope! But in recent years, I have finally begun to succumb to the torture of the dreaded manual, mostly due to the invasion of my home by Lego, remote control helicopters and the like that absolutely positively required me to read a manual. And guess what--it's not that bad, as they actually make the process easier! Who knew?? Anyway, my warming up to this form of literature has had one massive side benefit: it has spilled over into following cookbook recipes, which has opened up a whole new world for me. All of a sudden, I am really into cooking! And what I am cooking actually tastes good! Newly inspired, I took a cooking class with some friends last week. One warned me to come to the class hungry because we'd be eating (and drinking lots of red wine) as we cooked. (It was a good thing I wore my new favorite Paige jeans, which are not only perfectly, comfortably stretchy, but as my friend commented, "They are truly skinny jeans--as in they make you look skinny." Even, I guess, when you are pigging out!) 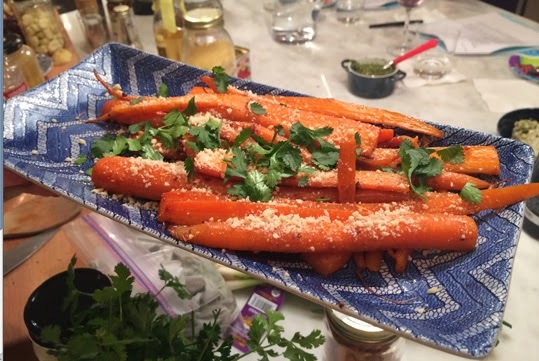 We made date chutney, leek cream cheese, cilantro pesto, chili carrots (my fave, pictured above, recipe below! ), curried beet polenta, quinoa caviar and the best Angel Food Cake. At home, in the last few days, I've whipped up slow-cooked kale with pancetta and gluten-free bread crumbs, spicy black bean soup, sesame noodles, and creamy chicken quinoa and broccoli casserole. Tonight I will take on a vegan-friendly roasted cauliflower and caper situation with garlic aioli, a recipe from Gwyneth Paltrow's My Father's Daughter. Hopefully, all this tasty food won't make all the well-fitting clothes in my closet obsolete! In a large skillet cook garlic in oil over medium-heat for 30 seconds. Add carrots. Cook and stir for 6 minutes. Add 3 teaspoons of water. Cover. Cook 4 minutes more. Season to taste with salt and pepper and a splash of hot sauce. The link of the Paige jeans isn't working.. do you have another? I am looking for a new pair of skinny jeans.